Doll Divine Blog: Something new. I'm happy with how the Vampire turned out, but he took forever. My new mission is to try to break my doll making record time (3 weeks). I'm making a girl in traditional Japanese garb. It's not fantasy, but folk costumes are something I always knew would work its way into Doll Divine. 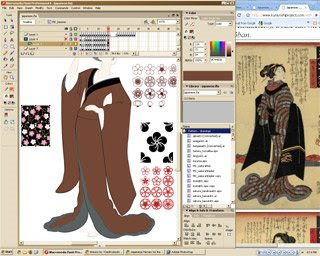 Progress is steady, thanks to the abundance of both free vector patterns and ancient Japanese art on the internet.